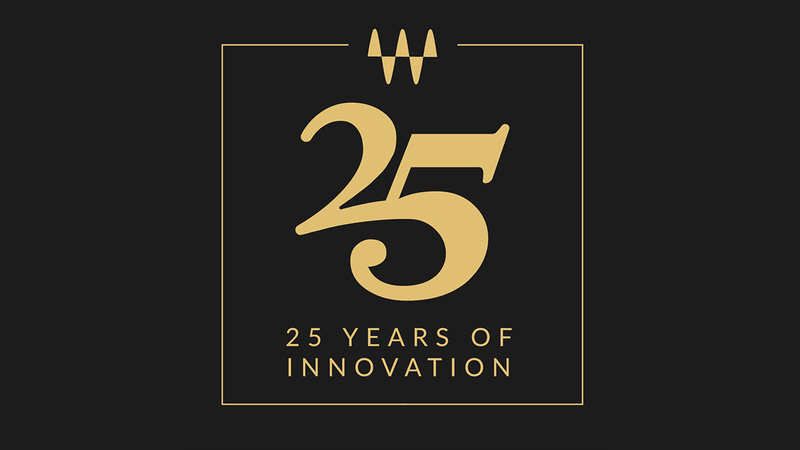 Waves Audio celebrates its 25th anniversary, an occasion that also marks the advent of the digital plugin itself – a concept that has revolutionized every corner of audio production over the last quarter-century. Twenty-five years ago, Waves introduced the world’s first audio plugin, the Q10 Paragraphic Equalizer. With its introduction, Waves not only transformed the way we work in the recording studio, it also created an entirely new industry sector: software-based audio signal processing. The Q10 revolutionized the professional audio industry, transforming the way we work with audio and giving the computer a new status in music recording. For the first time, it offered high-end professional sound quality in-the-box that was on par with the sound provided by hardware gear. What was then considered a surprising foray into computer-driven sound processing tools has since become a prevalent industry standard. Waves tools are now being used to improve sound quality in virtually every sector of the audio market, from recording, mixing, mastering and post-production, to broadcast, live sound, and consumer electronics – hence Waves’ motto, “Where there’s sound – there’s Waves.” For its accomplishments, Waves received a Technical GRAMMY® Award in 2011. Propelled by an increasingly diverse and comprehensive product line, Waves quickly became a favorite of engineers worldwide and the first choice of recognized audio trendsetters. Waves has gone on to develop a comprehensive line of over 200 audio plugins, an impressive line of diverse hardware units, and an expanding line of state-of-the-art virtual instruments. Over the past 25 years many revolutionary Waves plugins have become industry standards. Game-changing tools by Waves have included the L1 and L2 Ultramaximizers, which changed the way level maximization and peak limiting are handled by mixing and mastering engineers today; and Waves’ groundbreaking modeling of classic studio legacy hardware, which delivered to any audio engineer or home producer the sound of the SSL and API consoles as well as original rare gear from Abbey Road Studios. Other early breakthroughs have included valuable time-saving tools like Vocal Rider and Bass Rider; pioneering early effect plugins such as the MondoMod, SuperTap, MetaFlanger; and crucial workflow processors like the S1 Stereo Imager (the first ever stereo manipulation processor) and the PS22 Stereo Maker (a pioneering mono-to-stereo converter). Waves also spearheaded and remains a leader in noise reduction plugins dedicated to audio repair. It is hard to imagine the past two-and-a-half decades’ effort to remaster classic recordings from timeworn magnetic tape and old vinyl to digital formats without the advent of Waves’ audio restoration tools – a shining example being Disney’s old optical media, long considered lost or extremely costly to resuscitate, which were restored using Waves tools. Of special note in Waves’ history of audio innovation are the unique Waves Signature Series plugins, created in collaboration with the world's top producers and engineers. These precision-crafted plugins capture each artist's distinctive sound and production style, using customized processing chains designed by the artists themselves, and delivering them to the end user in the form of extremely easy-to-use plugins. In recent years Waves has also become an established, major player in the live sound market. Live mixing engineers can now bring studio sound to the stage and mix live sound with an unprecedented level of intricacy by mixing their shows with Waves (and third-party) plugins, with all the wealth of precision control they offer. They can do this thanks to two groundbreaking software innovations by Waves: the Waves MultiRack plugin host, which lets live engineers run plugins on any live sound console, and the Waves eMotion LV1 live software mixer, which enjoys success among FOH, monitor and broadcast engineers in need of a highly portable live digital mixing console providing pristine, studio-quality sound. Most notably, Waves’ groundbreaking SoundGrid technology and applications have become an industry standard for real-time, low-latency audio processing and efficient, cost-effective audio networking. SoundGrid has entirely changed the workflow possibilities for both audio engineers and musicians: with SoundGrid, they can now run higher plugin counts than ever by offloading plugin processing to external servers and freeing up their computers’ CPU, record with plugins in real time and network all audio in their studio in the most efficient way possible. Waves’ most recent innovations have established Waves as a major player in the 360-degree, 3D and VR audio market. Waves recently introduced the Nx Virtual Mix Room plugin, a virtual monitoring tool that delivers, on headphones, the same three-dimensional depth and panoramic stereo image one would be hearing from speakers in an acoustically treated room, including settings for stereo, 5.1 and 7.1 surround and now full 360-degree Ambisonics audio. Together with its companion Nx Head Tracker, Nx helps audio engineers better predict how their headphone mixes will translate to speakers, finally turning headphones into a mixing tool they can trust. Waves Nx is also available as a consumer application that delivers a 3D audio experience on any set of headphones, enabling consumers to experience movies, music and games with real-world 3D sound. Waves Nx technology is now also used in VR games such as Racket:Nx. Finally, Waves is a market-leading innovator in the consumer electronics market, where under its Maxx brand it offers licensable algorithms for consumer electronics devices. Waves technologies dramatically enhance the audio performance of personal computers, tablets, mobile phones and applications by such industry leaders as Dell, Google, Fitbit, TCL, Intel, Fujitsu, Asus, Hisense, LG, Vivo and more. Used in scores of commercial and personal recording studios and by hundreds of thousands of users worldwide, the Waves sound can be heard in the world’s most popular hit recordings, major motion pictures, hit television shows and popular video games. Waves’ reputation for outstanding quality and technical leadership make it not only a strong market leader in professional audio software, but also the preeminent provider of intelligent audio in consumer electronics. Celebrating its 25th Anniversary, Waves is now offering revamped and reskinned versions of three of its classic plugins: the Q10 Equalizer, the AudioTrack channel strip plugin, and the L1 Ultramaximizer level maximizer/peak limiter. These revamped 25th Anniversary editions include new plugin features, as well as a choice between two graphic user interfaces – the classic ‘Legacy’ interface, and the new ‘Modern’ interface created especially for the 25th Anniversary celebration.